Scottish Geographic Information Systems (GIS) company thinkWhere is setting its sights on global expansion with the launch of a new cloud-based platform for GIS and geographic data. theMapCloud allows maps and associated records to be accessed anytime and anywhere in the world through a web-connected computer or mobile device. Through standard web browsers, users can view, retrieve and share maps, map layers and data. As well as providing a platform for GIS and other web applications, theMapCloud can be used for a host of data services and software as a service applications. theMapCloud is offered with fully managed datasets from publishers such as Ordnance Survey and OpenStreetMap. Designed using the latest Cloud and Open Source technologies and provides a truly flexible, reliable, scalable and high performance platform for serving geographic data and applications. As a cloud solution, thinkWhere can enhance and upgrade the platform globally without affecting the user. theMapCloud has been developed for organisations that require better access to – and easier sharing of – geographic datasets. It is an ideal solution therefore for government, local government, infrastructure companies and utilities. thinkWhere offers a range of software applications and services to help organisations move onto the cloud and successfully implement theMapCloud. thinkWhere has utilised theMapCloud for their own ecommerce data store. Called mapTrunk, it is an intuitive web service for purchasing OS MasterMap and is an example of the type of mapping application which can be built upon theMapCloud. 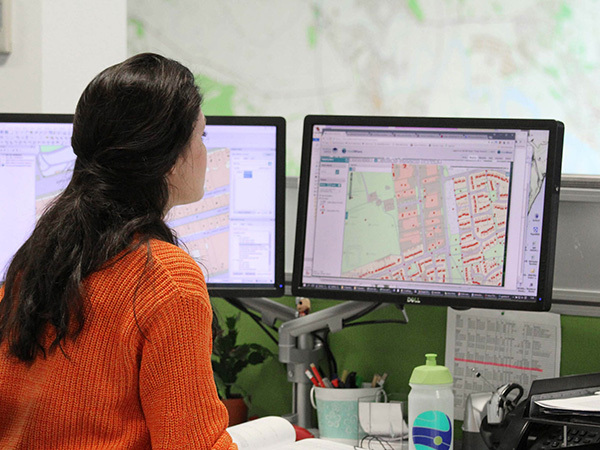 For organisations requiring a simple GIS solution for basic mapping, such as site assessments and onsite works mapping, thinkWhere has a product called GroundMapper. theMapCloud has been developed over the last two years in association with a number of key users in the UK and the USA. It has already been successfully implemented by the Scottish Government to provide access to mapping by around 100 members of the One Scotland Mapping Agreement (OSMA). Other adopters are British Library and US-based Humanitarian OpenStreetMap Team (HOT). Originally Forth Valley GIS, the company started in 1993 providing GIS services to Central Regional Council before, following local government reorganisation, developing a shared GIS service for three unitary authorities. In 2007 the company began operating as an arms-length commercial operation and rebranded as thinkWhere in 2007.